The Platonic Solid & Sacred Geometry Essences are powerful reminders to our energetic system of their original matrix or blueprint. Working at a subtle level these Essences help to encourage restoration of order and balance within our energetic blueprint. There are five Platonic Solid Essences, three Sacred Geometry Essences and two combination Essences. Sacred Geometry is the universal design system through which the energies of creation organize themselves into form. The patterns and shapes of sacred geometry makeup all living things but can most obviously be seen in nature, for instance in the beautiful patterns of snowflakes, the shapes and forms of crystals and the intricate design of flowers and pinecones. Sacred Geometric shapes contain life force energy, light, sound and colour arranged in specific patterns of creation. They can help us to raise our consciousness and ‘remember’ ourselves as the divine beings that we truly are. In the ancient mystery schools, the study of sacred geometry was considered an indispensable requirement for gaining a greater understanding of life. The layers of our Light Body are made up of sacred geometric shapes each holding a level of consciousness that provides an anchor point for our multidimensional self. As we raise our consciousness beyond third dimensional understandings our ability to connect with these layers of ourselves to become intentional creators is expanding rapidly. The Platonic Solid shapes are well known aspects of sacred geometry that are unique in their characteristics; all faces are the same size, all edges are the same length and all interior angles are the same measurement. If you place a Platonic Solid shape inside a correctly proportioned circle each of its points will touch the surface of the sphere. There are five basic shapes that fulfil all these criteria; the Cube or Hexahedron, Tetrahedron, Octahedron, Icosahedron and Dodecahedron. All five Platonic Solid shapes together with the Sphere form the component parts of Metatron’s Cube, which itself is part of the Flower of Life pattern, the sacred geometric pattern from which all forms of life are created. In sacred geometry the cube and the sphere are considered to be the primary male and female shapes. All the Platonic Solid shapes will fit inside both a cube and a sphere. According to ancient tradition each of the platonic solid shapes has a connection with one of the elemental energies. There are ten Essences in this set. Five of the Essences are made from the Platonic Solid shapes, three from sacred geometric shapes - Sphere, Star Tetrahedron and Flower of Life, and two combination essences - Metatron’s Blend and Inner Light. 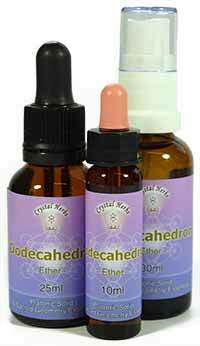 These essences are available individually or as a set of ten Platonic Solids & Sacred Geometry Essences. Essences made from sacred geometric shapes can be powerful reminders to the body of its original matrix or blueprint. Working at a subtle level they can encourage restoration of order and balance according to the current blueprint for the expansion of human consciousness. 10ml & 25ml Bottles: Take 4 drops on the tongue from your chosen essence between 2 & 4 x a day, continuing until the bottle is finished. 30ml Sprays: Spray liberally into the auric field for a quick energetic re-balance or use over a period of time to support more permanent transformation. Preferably take 10 minutes away from food and drink. These are all stock level essences, to gain maximum benefit from your essence we recommend that you take it without further dilution. Storage Advice - It is best to store vibrational medicine in a cool place away from TV’s, mobile phones, microwaves, computers etc. If you need any help or advice with choosing or using the Platonic Solid Essences, please see our Choosing An Essence page or you are most welcome to contact us if you would like to speak to someone. From making the Mother Tincture to bottling and labelling the stock bottles that we send you, each essence is handmade with love and care helping to ensure that we provide you with the best possible quality of essence.